It’s a good laugh, but I must admit it’s pretty true. There are certain characters who can influence me into starting pretty much any line of toy or statue! The pathway to ending up owning the Sideshow Colossus Legendary Scale Bust, however, is a bit more circuitous, and I’m not taking all the blame for this one! Once that idea got into my head, I was sunk. As you can clearly see, however, it really wasn’t all my fault this time!! The Colossus Legendary Scale Bust, however, grew on me in photo form each time I looked at it. So, knowing that the Aussie dollar is amazingly strong at the moment and that I really would need Colossus to go alongside my favourite blue furry mutant teleporter, I took the plunge. Happily, I am far from disappointed with the purchase. The scale is pretty much as I imagined it – at 12.5” high, it’s about the size of a full-sized statue. As you would expect, his shoulders are very broad, coming in at 14” at his widest point. 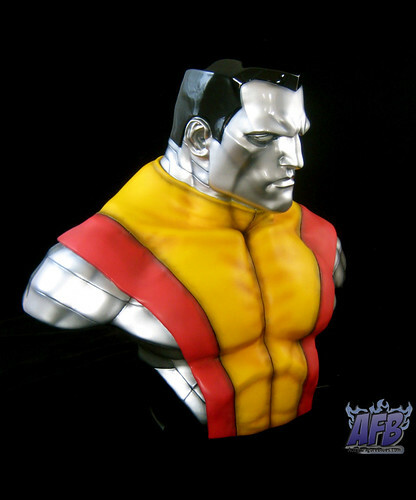 Colossus isn’t always drawn with as huge a neck as he has here. It works for this piece, as it gives it the kind of bulk you’d expect from Colossus, but were it a full body piece, he’d have a pinhead for sure. 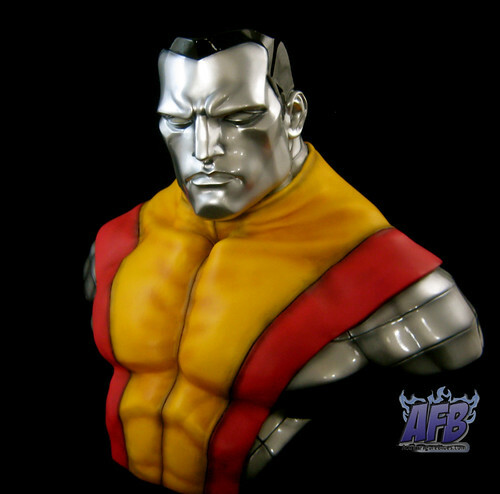 Colossus’ armoured face has often been drawn as quite expressive. What’s shown here is a serious expression, but by no means blank. The sculptors have obviously put thought into how a man’s face would be formed if it transformed to metal, and the result is still something that looks very human, but with angular lines, particularly around the nose and jawbone. I’m particularly impressed with how this has been done, as underneath the metallic angles, you can see not just the shape of a man’s face, but that of a Slavic man as Piotr Rasputin would be – the high cheekbones and wide features of a good Russian boy. This could just be my imagination at work, but I’ll give Sideshow the credit – it’s impressive. Something else I love about this piece is Colossus’ hair – it’s black, but as shiny and metallic looking as his skin, as it should be. I like how it reflects the light. To help this effect, his uniform has been painted with a duller sheen to contrast. It works very effectively! All up – this one is a real winner. I won’t be starting on any kind of completist rampage with this series, due to cost and space. I have subsequently picked up The Thing bust as part of a trade, and was quite surprised at how much shorter it is than Colossus. I think Thing may be one of the earlier pieces, but the contrast is that great they really can’t be displayed together, which is a shame. As for other purchases, I would love to find a Captain America for a price less than a kidney…..
Now all I need is for Sideshow to hold up their end of the deal and produce a Nightcrawler Legendary Scale Bust so that this great piece can compliment it! In the meantime, just remember – this particular piece was not all my idea! Honest!! You can see more pics at Facebook, discuss this at the AFB Forum and comment on this post to enter the March AFB Comment of the Month Contest! Wow, that thing looks really nice! Nothing I would every buy, personally, but I can't deny it's a great piece. Oh no you don't! You're not palming this off on me! Toy Lines! The AFB Caption Contest: Round Two! Star Wars Fans - Unique Vintage Sale! DIY Comic Book Binding with dozymuppet! Many, many months of MOTUC!